President Rodrigo Duterte and King Salman bin Abdulaziz Al Saud in a bilateral meeting held at His Majesty’s private residence in Rawdhat Khuraim on April 11, 2017. MANILA, April 18 – President Rodrigo Roa Duterte concluded his week-long state visits on a high note, bringing home with him more than USD 900-million deals and hundreds of amnestied Filipino workers. The President went to the Kingdom of Saudi Arabia, Kingdom of Bahrain, and the State of Qatar from April 10 to 17. He arrived in the Philippines with more than 138 overseas Filipino workers (OFWs) from Saudi Arabia, part of an ongoing repatriation process by the Philippine government due to the grant of amnesty to overstaying and undocumented foreign workers by the Saudi government. During the President’s week-long three-country visit, he witnessed the signing of over USD 925-million worth of investment deals among Saudi, Bahraini, and Qatari businessmen, which are expected to create 62,000 jobs. The President also saw the signing of agreements on investment; labor cooperation; strengthening of diplomatic ties; air services; avoidance of double taxation; and cooperation on culture, health, and technical and vocational education and training. Both sides acknowledged that the visit strengthened PHL-KSA long-standing relations in all areas of cooperation, especially in the economic, trade, and security sectors. Both agreed that terrorism represents the biggest threat to peace in the world today and exchanged views on how to counter it. The President thanked The Custodian of the Two Holy Mosques King Salman bin Abdulaziz Al Saud, for the Kingdom’s continued hosting of more than 760,00 Filipino workers and noted that the remittances sent by these OFWs support the market-driven economy of the Philippines. The King assured the President that Philippine labor is greatly valued in the Kingdom and both the King and the President agreed to work on the need to uphold the welfare and well-being of these workers. King Salman and President Duterte exchanged viewpoints on how to further develop bilateral relations and discussed regional and international issues of common concern. 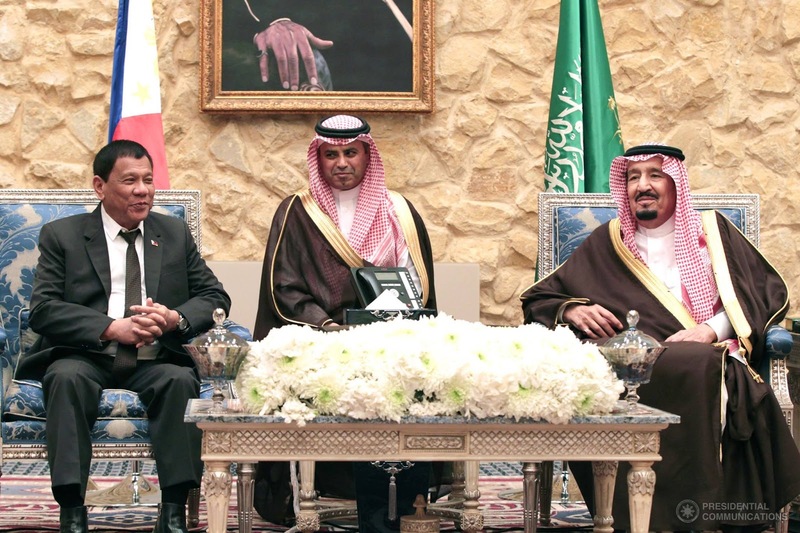 The Philippines noted the significance of Saudi Vision 2030, which will open many avenues for cooperation between the Philippines and the Kingdom. Aside from His Majesty King Salman bin Abdulaziz Al Saud, the President also met with Crown Prince Mohammed bin Nayef bin Abdulaziz Al Saud, Deputy Crown Prince Mohammed bin Salman bin Abdulaziz Al Saud, and Minister of State for Foreign Affairs Adel bin Ahmed Al Jubair. The Deputy Crown Prince, during his meeting with the President proposed to further strengthen cooperation efforts in countering terrorism through training of security officers. Both leaders witnessed the signing of three agreements pertaining to labor cooperation, political consultations, and training for diplomats from both countries. On April 12, the President attended the Trade and Investment Forum where Saudi businessmen made investment commitments, worth USD 469.34-million, expected to create 16,000 jobs. Before flying to Bahrain the President met with 1,500 members of the Filipino Community in Riyadh. The President arrived in Bahrain on April 12 and was welcomed by the Bahraini Deputy Prime Minister Prince Salman bin Hamad Al Khalifa. During the lunch in honor of the President, His Highness Prince Salman expressed the Bahraini people’s gratitude to Filipinos and acknowledged their huge contribution to all facets of Bahraini society and economy. Both leaders also agreed to increasing two-way business and recognized the strong potential of trade and investment between the Philippines and Bahrain. During the private meeting of the President and King Hamad bin Isa Al Khalifa, the two leaders discussed and exchanged views on important regional and international issues, and on how to enhance political, economic, cultural, and security cooperation between the two countries. The President thanked King Hamad for the Kingdom’s continued hosting of almost 60,000 Filipino workers and noted that the remittances sent by these OFWs helped support the economy of the Philippines. The two leaders witnessed the signing of four agreements on the establishment of a High Joint Commission that is aimed at enhancing economic and political cooperation, training of diplomats, air services, and agreement on the avoidance of double taxation. The President also witnessed the signing of a Memorandum of Understanding between the AMA Group Holdings Inc. and the Nader and Abraham Sons of Hassan Company W.L.L. on the additional investment of USD 250-million, which will see the expansion of the operations of the Banana plantation of RP Bahrain Harvest Inc. in Sarangani up to 10,000 hectares. This project is expected to provide 40,000 jobs for farm workers and is seen to support the peace and development agenda of the Duterte administration for Mindanao. The President attended the Bahraini and Filipino business leaders’ meeting at the Capital Club Bahrain. Before departing for Doha, the President also met with the 4,000-strong Filipino community in Manama at the Khalifa Sports City. The Prime Minister of Bahrain, Prince Khalifa bin Salman Al Khalifa, made it a point to arrive earlier than his original schedule from a previous overseas commitment to personally meet with the President. Both leaders discussed ways of expanding cooperative ties between the Philippines and Bahrain. The Prime Minister would later send off the President. The President arrived in Doha, Qatar on April 14. The President attended the Philippines-Qatar Business Forum where USD 206-million worth of business deals between Qatari businessmen and the PEZA were secured, which is expected to create almost 5,770 jobs in the Philippines. The President also met with an estimated 4,500 members of the Filipino Community in Doha at the Lusail Sports Arena working and living in Qatar. On the second day of the President’s State Visit to Qatar, on April 16, the President was officially welcomed by Sheikh Tamim bin Hamad Al-Thani, the Emir of the State of Qatar. The two leaders expressed willingness to further expand cooperation and collaboration between their two countries. They also exchanged views on various regional and international issues of common interest. The two leaders also witnessed the signing of four agreements in the areas of culture, health, technical and vocational education and training and investment promotion and protection. The Investment Protection and Promotion Agreement (IPPA) will facilitate the influx of USD 1 billion worth of investments from Qatar’s sovereign wealth fund devoted to development projects for the countryside, including Mindanao. This will continue to increase in the coming years. Also, the President met thousands of overseas Filipinos at the Lusail Sports Arena in Lusail City, Qatar on April 15. He departed Doha for Manila the next day, April 16, on board Philippine Airlines flight PR 001. What is deeply encouraging is the general sentiment of GCC leaders who show unabashed admiration for the President, expressed by a Qatari Minister, “You are very lucky to have a leader like President Duterte. He knows exactly what he wants for his nation.” In the President’s own words, “First and last is the public interest.” The real benefit of his trip is good will for Filipinos, and good will from the nations they have served for so long.